We are well into our second week of fall, with summer still in our minds from the beautiful indian summer weather we have been having as of late. However, that tell-tale autumn chill is in the air, and in timely fashion, we have released the autumn wool collection over at L'Atelier St. George. We shot the lookbook out in Point Roberts a few weekends ago, and we could not have asked for better light (or a better model: our very own Anne Vivier-Manceau) to truly capture the essence of this collection. May 30, 2015: Some of the neighbourhood kids organized a lemonade stand by the sidewalk adjacent to our shop to help raise funds for the Little Mountain Playground. The lemonade was a huge hit, and in the two hours that the stand was up, the kids were able to raise just a little over $100. The price of an ice-cold glass of homemade cucumber lemonade was by donation, and it was a beautiful day for it. Passersby and customers happily sipped a glassful or two on that particularly hot Saturday afternoon. We are also holding a fundraiser for The Little Mountain Playground in the form of an elegant evening filled with local wines, oysters, and grilled sausages. Details and a link to the tickets can be purchased here. After about an hour, the kids ran off to play 'hospital' in lieu of watching over the stand, so the adults (including myself) took over and jokingly tried to upsell the lemonade with promises of spiking the refreshing concoction with tequila... which, of course, we eventually did --- but for ourselves, not for the customers (stand down, City of Vancouver!). The team has worked long and hard for months to bring our version of Campesino to Vancouver, and the fruits of that labour were most certainly reaped with the overwhelming positive response and turnout from our first weekend! The first day left the pop-up looking a little barren, but rest assured the pop-up will continue to evolve over the course of its two-week run as we bring in more edibles, clothing, jewelry, and ceramics, so make sure to check back often. New stock will be updated at our online shop as well, for those of us who cannot make it to Vancouver for our annual summer pop-up. Below are some of the photos I took the day before the pop-up opened to the public. I was unable to take photographs on the first day of the pop-up due to an incredibly packed house; it was madness! But it's a good kind of mad; lots of positive energy and vibes, sunshine, and friendly faces both familiar and new. Thank you to all of those who came to support us this first weekend and we hope to see you throughout this pop-up's entire run and beyond! One more sleep until our annual summer pop-up! We have been working tirelessly to transform the space into our version of Campesino. 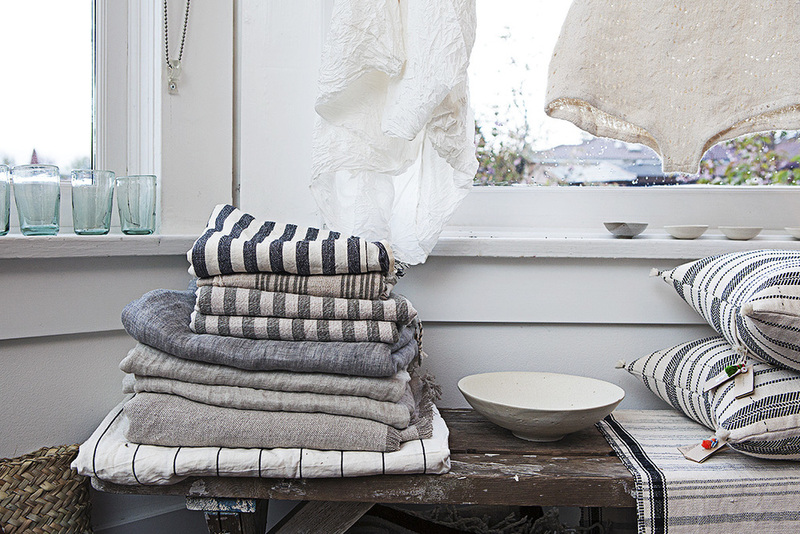 Neutral tones, simple lines, found objects with decades of history melding with the new, bowls and plates with pitted textures, burnished metal surfaces, clean and crisp whites, wrinkled sheets, the scents of spring... these are what make the sensory experience of this year's summer pop-up. Campesino will be up every single day from tomorrow (the 25th) and until the 10th of May, from 10 am to 5 pm. For those who cannot shop our Campesino pop-up in person, we will be offering this same experience on our online shop. Perhaps one of the few good things about the virtual world is that you can shop anywhere, anytime, 24 hours a day, 7 days a week. We hope to see you all tomorrow! This post will mark the start of a new bi-monthly series on dishes that remind us of home. Les Recettes de Ma Mère (My Mother's Recipes) will take a look at some of the dishes we have grown up with, with special emphasis on the multicultural culinary landscape Vancouver has, and how each of these cultures' dishes has defined 'comfort' and 'home'. Callos a la Madrileña (cal-yos a la ma-dri-le-nya) is a tripe stew, and its origins stem from Madrid. The Filipinos have adopted this dish, among many other Spanish dishes, largely because the country was colonized by the Spanish in the mid-1500's, and remained under the Spanish rule until the late 1800's. Spain has left more than just cultural traces in the Philippine culinary landscape, and while, admittedly, Filipino cuisine is difficult to describe, much of the country's cuisine is European by nature. My mother takes an entire day (or two) to prep for this stew. I remember the smell of tripe tenderizing; that is usually what she tackles first, and it is not a very pleasant smell. The sauté of aromatics that come after the meaty-fatty mise-en-place - that sweet-char smell that emanates from the bell peppers, the onions, and the garlic hitting the hot oil - are what I look forward to smelling the most when she prepares this family favourite. When the dish is finally ready to eat, I serve myself a generous portion, but I usually pick off the tripe from my dish. I was never a fan of the texture, but the use of tripe really lends itself to the richness and the resulting tomato-smoke-umami of the stew. 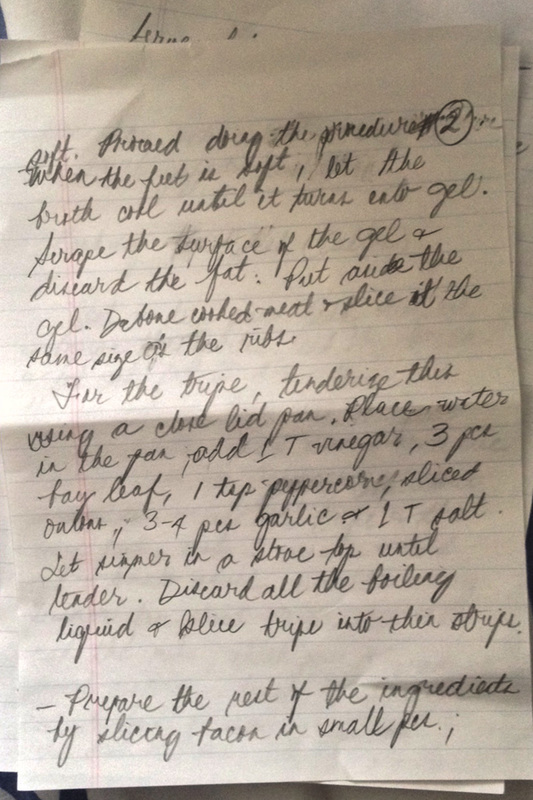 iPhone shots of my mom's handwritten callos recipe. She calls this version of the stew the Canadian version, or more aptly, 'Joyce's Version'. This version is a tripe-less version, and is much easier to prepare for the curious home cook who wants to try something different, but has not the wherewithal to acquire premium ox tripe and ox legs, nor the time and patience it takes to go look for a great butcher who will source a decent product for you. That is me, in a nutshell. I work more than 40 hours a week, I have allowed myself a small food budget, and I hardly ever have time to cook for my self these days, much less take two whole days to prepare this classic Spanish-Filipino stew. So when I was presented with this assignment, I racked my brain for two whole days trying to figure out how to replicate the classic flavours of callos without having to deal with the smell of tripe and the costs it takes to make the stew. I pored over my mom's messy handwriting for her callos recipe, dug deep into my memory banks for the flavours that stood out for me, and, by golly... I think I've done it! I know I've done it - because the proof, as they say, is in the pudding (or stew, in this case). Sorry, mom! My version is just as good, I swear! 1) Chop the vegetables and set aside. 2) Drain the liquid off of the can of chickpeas and set aside. 3) Set the dried aromatics, spices, and seasoning aside: dried thyme, Mexican oregano, bay leaves, chile de arbol, organic bouillon cube. 4) Dice bacon and slice the cured sausage. 1) Preheat your oven to 350C. 2) In a Dutch oven or deep skillet, heat olive oil. Gently fry the bacon until nice and crisp. Drain with a slotted spoon and set aside. 3) Fry the sliced chorizo in the bacon fat until the edges are slightly crisp. Drain with a slotted spoon and set aside. 4) Brown the beef stew meat until outer exterior is nicely caramelized. Set aside. 5) Pour away any excess bacon fat, but leave some for the vegetables to sauté in. Sauté the peppers and onions in the pork fat until slightly softened. Add the garlic, Mexican oregano, and dried thyme and continue to sauté until garlic has sufficiently browned and has imparted its garlicky aroma. Take the vegetables out and set them aside for later. 6) In the same dutch oven, add the browned beef and the chorizo and cover with three cups of water and the two cans of peeled, whole tomatoes. Crush the tomatoes with your wooden spoon. Add the beef bouillon cube, the chile de arbol, and the bay leaves and make sure to scrape any excess brown bits off of the bottom of the pan. Add the brown sugar, paprika, and the adobo peppers and let it dissolve into the liquid. Put to a gentle simmer before turning off the heat and place inside your preheated oven. 4) Leave the stew inside the oven for two hours. After two hours, add the chickpeas, and leave the stew inside the oven for another 45 minutes to an hour. The chickpeas will thicken the sauce naturally without the addition of the tripe. 5) After the last hour, fish out the bay leaves, and stir in the reserved sautéed vegetables and crispy bacon. Test the stew for seasoning. I found that over the course of the three hours, the chorizo has imparted most of its seasoning into the stew, so the callos did not need any salt. Serve the stew over cous cous with lemon zest and chives, or traditionally, over steamed jasmine rice.